I have worked for many years providing creative opportunities for people of all ages and abilities. I have learnt through experience that creativity provides the opportunity for people to experience a richer quality of life. I fell into working part-time as an Activity Coordinator in a Care Home close to where I live, during the time when the budget restraints in local authorities meant less freelance creative project work was available. One of my pressures as an Activity Coordinator is to be seen to be delivering to groups of residents. I knew very early on in this role that people locked into their dementia sat on the side lines and did not appear to benefit from this group approach and often dozed through my sessions. However I do feel people do benefit from the positive atmosphere generated in chatty and fun groups and therefore should be included. 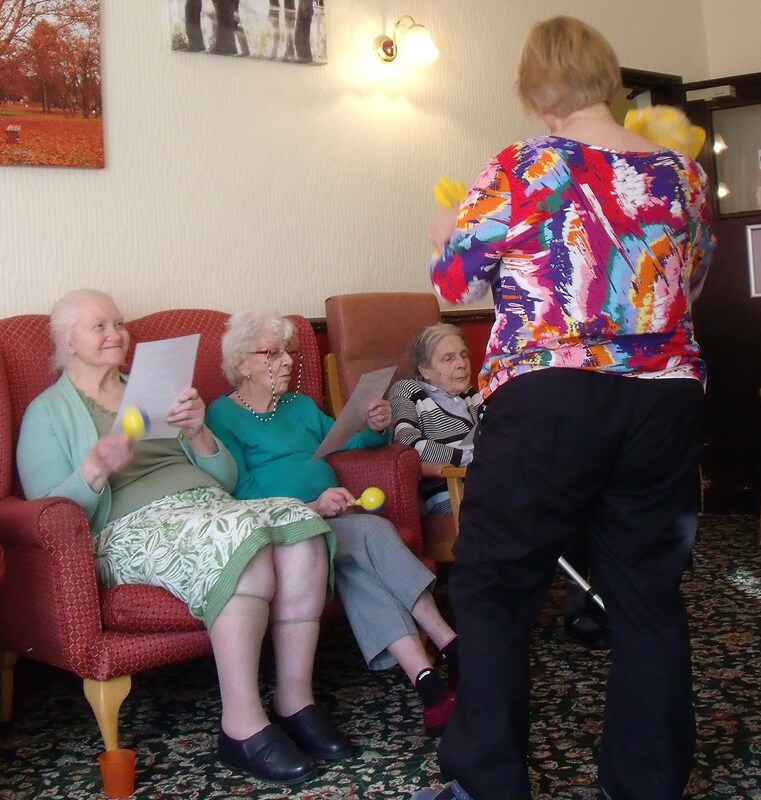 I have devised many activity and creative sessions using different materials and props within the Care Home while seeking to engage with a diverse group of people with differing abilities. The journey is personally rewarding as I am able to use my creative ability to think outside the box to conjure up endless ideas to generate engaging and joyful sessions. Having worked with children and adults with Learning Disabilities I was aware of the agenda of providing ‘age appropriate activities’. I attended a conference concerning people with Profound and Multiple Learning Disabilities (PMLD). At this conference a presentation was challenged on the age appropriateness of some activities. The speaker talked about how approaches to providing care were currently focus on being ‘person centred’ and that if activities and the materials were accessible to a person then it should not matter if they are designed for younger or older people. It is an individuals abilities and interests that matter not what age they are, allowing for a broad range of activities to be chosen and used by them. When new in post as an Activity Coordinator I attended the talk in Southwell Library about the use of ‘Puppets in Dementia Care’ settings by Karrie Marshal. 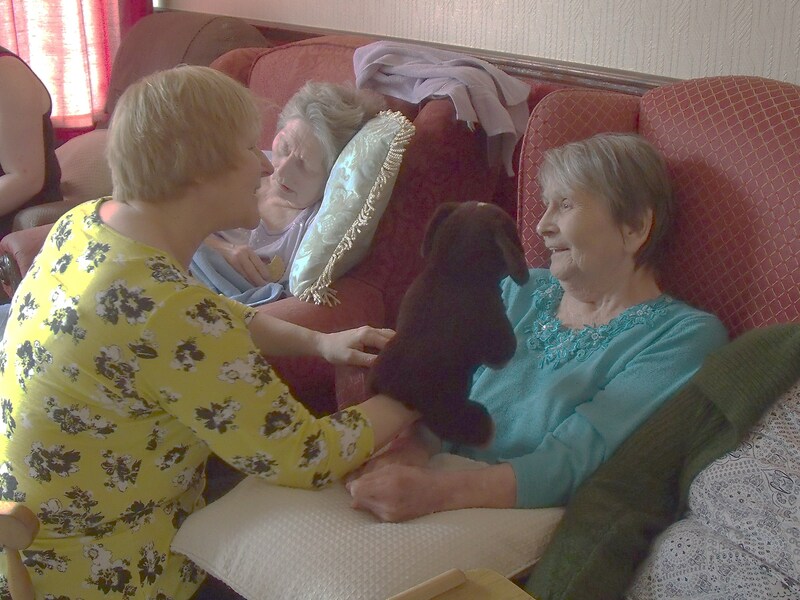 I listened with interest, Karrie had called in to Southwell on her way back from London where she had spoken at the ‘Care Matters’ conference in London about her creative work using Puppets in Dementia Care Homes in Scotland. This talk was the start of another creative journey for me. I have watched Chinese Puppet masters use puppets to tell ancient traditional stories, I have visited Prague and watched skillful puppeteers perform Opera to a room of adults. I understand that puppets only became children’s entertainment through TV during the late 1950’s. I had the realizations that puppets could be used with people of all ages and abilities. 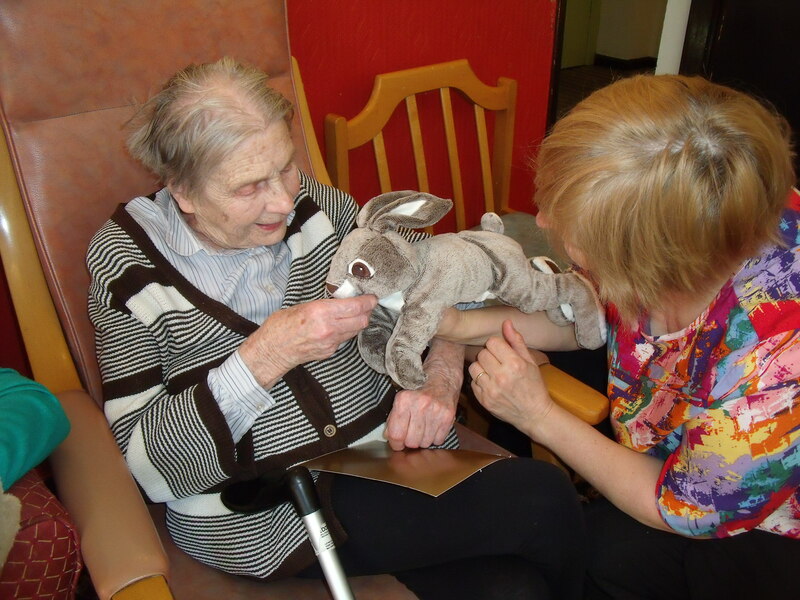 My fuse was lit, I quietly began using puppets to engage with people who spent long periods of time in bed through their ill health, including later stages of Dementia. I found that my puppets did bring cheerful moments to our times together. I discovered that I could visit and the need to speak, often to myself as they were unable to reply, was diminished due to communicating through the movement of the puppet. I observed how people would move their hand or nod their heads and share a smile. The puppets provided gentle, pleasurable time spent together in their later stages of life. One lady of hundred and two years old who prefered to stay in bed, told me to ‘bugger off’ with my colourful bird puppet because she wasn’t a child – of course I did! On another visit to her – I took a sheep puppet, she was prompted to reminisce about her childhood on the farm and caring for the animals, that afternoon we spent quality time together with no complaints. I have learnt some puppets work better than others – proving once again ‘what suits one person, does not suit another’.